Donna Chadderton, a long-time Falvey employee, retired on April 30 after 26 years. Her most recent (and highly visible) position was staffing, with fellow Information Services specialist Gerald Dierkes, the recently created Learning Commons Service Desk on Falvey’s second floor. Donna came to Falvey in 1988 as a part-time employee, working in Technical Services where she labeled books and filed catalog records. In 1991 she became a full-time employee, first working in acquisitions and then cataloguing. 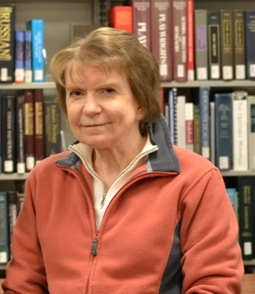 When an information desk was established as part of the first floor renovation in 2004, she helped staff it, while assisting with interlibrary loan borrowing and circulation tasks. “What did you find most interesting?” I asked Donna. “Within the Library, I enjoyed working at the Information Desk because every day was different by virtue of the nature of the job. The patrons were different every day, and one never knew what question would come up next. Some questions were mundane, but others were more difficult; and while working at that location, I often learned something new every day myself!” she said. Donna also served on the Science and Technology liaison team before it was reorganized. In addition, she served for many years on Villanova’s Environmental Task Force, which became the President’s Environmental Sustainability Committee, and served for many years on Villanova’s Earth Day Committee. Donna’s retirement plans include “reading a large number of books that I’ve collected over the years.” In addition to tackling several long overdue household projects, Donna will also continue participating in online projects with the Cornell Lab of Ornithology, volunteer at two local shelters that rescue homeless animals; and become more involved with a local conservation organization. In her spare time she also looks forward to spending more time gardening, traveling to favorite places, and walking her dogs. Donna is a native of Kingston, Pa., and a graduate of Misericordia University (BS in Biology) and Bucknell University (MS in Biology). Bon Voyage, Donna. You will be missed!